Gaining new customer accounts often involves some fancy footwork. This tip presents Info-Tech survey findings to help you identify when to approach a potential customer -- and who in the organization to approach -- so you can better understand business and IT needs, and ultimately develop the next great product or service. The single most profitable niche to your IT channel company is to find the 'next new thing,' according to Michael O'Neill, managing editor of Info-Tech Indaba, a research group dedicated to bringing IT manager survey findings and advice to technology providers, primarily with midsized firms. "[Channel companies] don't excel at acquiring new accounts. They plateau then cater to current clients," O'Neill said, explaining that the channel is missing many untapped opportunities to develop new solutions and gain new customers. 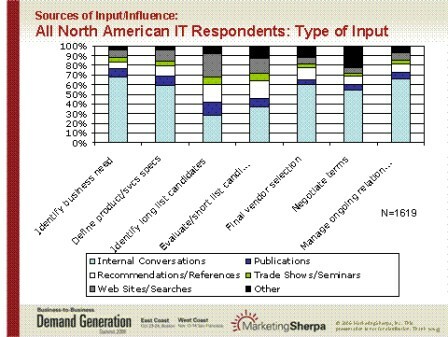 During a recent phone interview, O'Neill shared with SearchITChannel.com editors a slide show of findings from a recent survey of over 1,600 IT managers that can help IT channel companies, like yours, "generate leads for product categories the marketplace has never heard of before." Here we'll present the slides to you in some context so you may be able to fulfill those needs and potentially score new accounts. 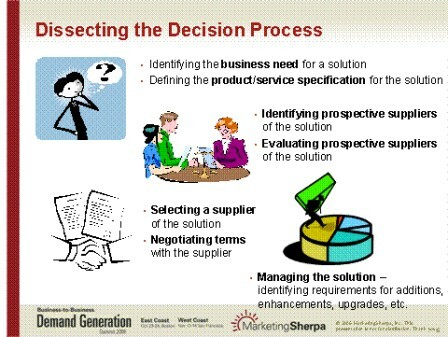 You must first understand the seven stages of the customer's decision-making process, outlined in the following slide. About half of what a solution looks like will be determined in the IT department, according to O'Neill. For that reason, it is key for channel professionals to be involved in the first two stages and the last three, where IT managers have traditionally kept to themselves. O'Neill further demonstrates this point by highlighting the sources of influence on an IT manager during various stages of the decision-making process. 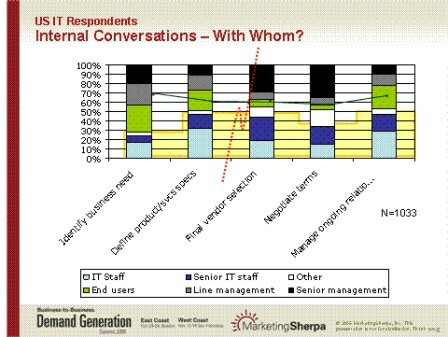 Conversations are mainly kept in-house by 70% of over 1,600 IT managers when identifying the business need, and by 60% when defining product and service specs – two areas where IT channel professionals can set themselves apart from the competition by getting involved with internal conversations and learning exactly what solutions need to be devised for a customer. Not surprisingly, references and recommendations commonly come from outside influencers, such as vendor Web sites, during the candidate determination stages. 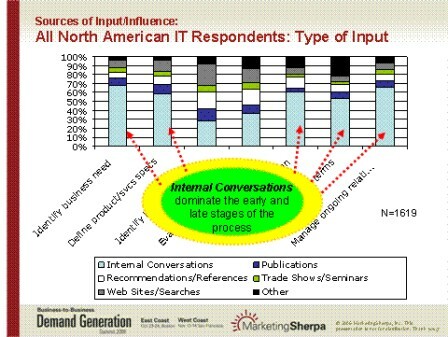 At that time internal conversations are the primary influencer for only about 30% of IT managers. "Web marketing is not a channel person's foray. [Channel people] have to position with a vendor that is strong on the Web," said O'Neill. He added that if your company wants to make a customer's list of potential solution providers -- particularly if the customer is a small-to-midsized business (SMB) -- it must work with a vendor that will integrate channel offerings into its Web presence, white paper recommendations and other publications, and provide public relations, marketing and analysis opportunities: "Web presence is a key vendor attribute to the channel." Trade shows, on the other hand, are not so relevant, according to O'Neill. "You can shout as loud as you want at trade shows but no one is listening," he said, adding that nowadays they're primarily for "kicking the tires." Once candidates have been determined, conversations are brought in-house again for the final vendor selection, negotiation and ongoing vendor relationship management. Exactly who to get in front of during the decision-making process is another factor. According to O'Neill's findings, end-user feedback must be taken into account when helping a customer identify a business need or defining product and service specs; senior IT staff must be targeted during negotiations; and a combination of end users, IT staff and senior IT staff should be involved with ongoing relationship management, as demonstrated in the slide below. 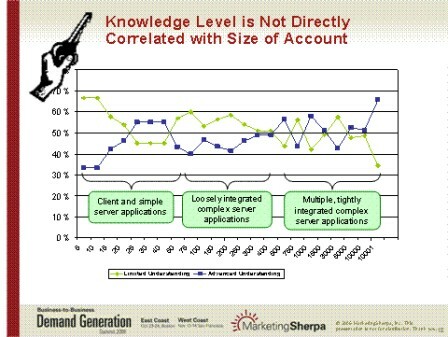 It is also important to note that knowledge level does not necessarily correlate with size of the account; it ties more to the size and complexity of the environment, according to O'Neill. "Customers have a limited initial understanding, when they're still in fact-finding mode," he said, as demonstrated by the yellow line in the slide below. Advanced knowledge, as evidenced by the blue line, doesn't come until customers have become comfortable in a tightly integrated server environment. As a channel professional, you should take the above findings into account to not only get in front of more customers at critical, untapped stages of the decision-making process, but to develop a better understanding of their needs so you may ultimately expand your solution set and gain new accounts.